In the year plus that I have been blogging about the VIX, I have periodically discussed the idea of VIX macro cycles. These cycles tend to last about 2-4 years in which the VIX has a definite trending pattern, but occasionally include a cycle of similar length (e.g., mid-1998 to late 2002) in which the action in the VIX is generally sideways. At the time I made that statement, I certainly did not anticipate that we would see multiple VIX spikes in the 30s during the first 2 ½ months of the new year, but even those events and the broad concerns about the stability of the financial system have not caused me to back away from my December prediction that volatility would flatten out “in the low to mid-20s range.” In fact, I still anticipate that volatility will spend a good portion of 2008 in the neighborhood of 22-26. Looking at the current VIX futures quotes, where the May through December futures are all trading just below 26, it looks as if my prediction is on the low end of the market consensus. The big question I have is about the duration of current VIX macro cycle – and of course the slope of any continued increase in volatility. 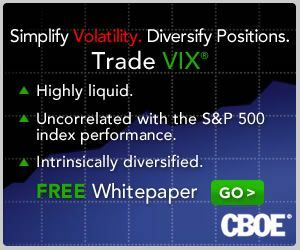 If the current slope of the volatility increase holds and the minimum cycle time is two years, that would project to a sustained VIX of about 40 by the end of the year. I don’t expect to see that scenario unfold, but it will be interesting to see how long it takes for the runup in volatility that started about 15 months ago to run out of steam. VWSI at +1, But Who Is Left to Panic? Short-Term Triple Top in VIX?